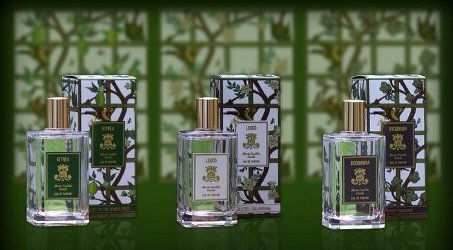 Italian niche house Maria Candida Gentile has launched a new trio of fragrances inspired by Flight of the bumblebee by Nikolai Rimsky-Korsakov. The three fragrances, Leucò, Kitrea and Syconium, share a common honey note. Leucò ~ "Leucò is the discovery of a white flower that blooms only at night, emanating an hypnotic and exciting perfume. The tuberose, both forbidden and spiritual flower, embraces the spirals of the incense, painting the picture of a religious celebration, with the colours of nature and the palette of soul." The notes include honey, cistus, lily accord, tuberose, benzoin and pepper. Kitrea ~ "Kitrea is the union of the citruses and the sea, the dream of an island full of lemons, the yellow of the sun that makes their peel shine from afar and the wind that carries the smell of the unlimited, salty horizon. It's the freedom of the waves and the inviting taste of the south, an invitation to life, unconditioned." The notes include honey, winter lemon, bergamot, fresh fruit and grey amber. Syconium ~ "Syconium is the ripening of the fig, the best expression of what nature has to offer in the form of fruit, the richness of the flavour and of the perfume that are brought to us by a tree close to us since the earliest times. The pulp but also the milk, the peel, the scorching sun and the shadow of the great leaves." With honey, milk, fig and sandalwood. Maria Candida Gentile Leucò, Kitrea and Syconium are available in 100 ml Eau de Parfum, €120 each. These sound quite nice and those boxes are so pretty! Hadn’t even paid attention, but you’re right — the boxes are lovely. Me too. Maybe worth a trip to Twisted Lily. I LOVE honey notes. Honey is a dicey note for me….but I do really like a few of her previous scents — Sideris and Exultat are gorgeous…. I will have to try Leuco and Syconium……Kitrea mentions salt , which is a major no-no for me (so I’ll pass on that one). I’m glad MCG doesn’t flood the market with 8-12 fragrances at a time like “some” houses we all know. Makes me feel like she put more thought into hers. I love her use of incense in Exultat and Sideris and generally find her perfumes original and attractive. I’m very much looking forward to what she does with honey. I brought samples of these three from Florence!